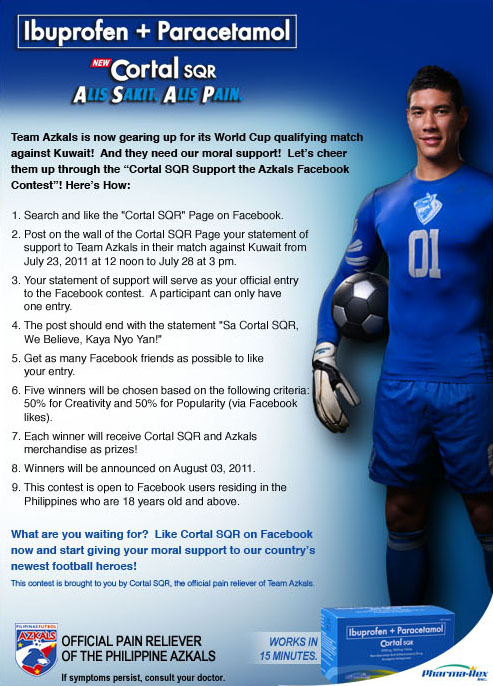 The 24-Hour Mommy: Join Cortal SQR's Support the Azkals Facebook Contest! Join Cortal SQR's Support the Azkals Facebook Contest! The Philippine football team failed to conquer the Kuwaiti football team in the first leg of their World Cup 2014 qualifying match. But that's no reason to fret, Azkals fans, because there's still the 2nd leg of the Azkals-Al-Azraq series happening on July 28, 2011 at our very own Rizal Football Stadium. Our national football team needs our support and the best way to do that is to show your support by joining Cortal SQR's Support the Azkals Facebook Contest. That way, you not only get to show support for the team but also get to win awesome Cortal SQR and Azkals merchandise! Kindly click this image to get a larger view. So, what are you waiting for? Visit the Cortal SQR Facebook page, LIKE them, and post your statement of support on their wall. Remember, your post should end with the statement "Sa Cortal SQR, We Believe, Kaya Nyo Yan!" Good luck!